Stephan Webb and more skeletons! Another day brings us another look into Stephan Webb’s slightly charred studio space. 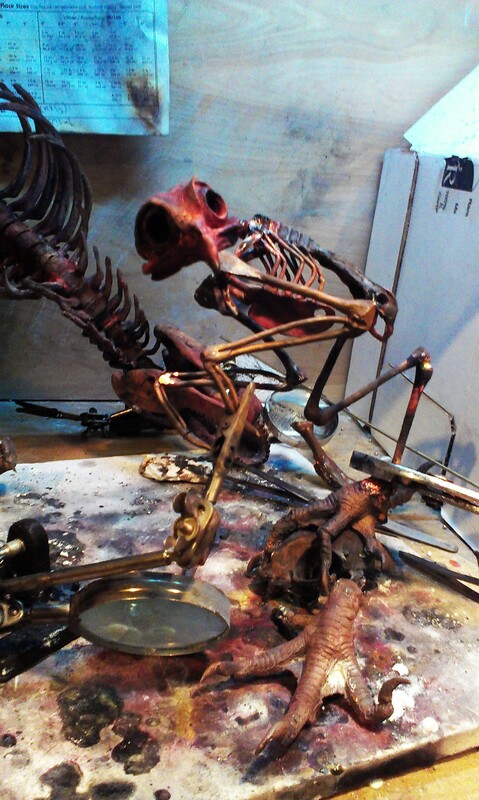 “Messy art – welding some bronze skeletons together!” he says, and we love the mess he makes. The owl skeleton that we last showed in hand carved wax has now been cast in bronze and looks appropriately majestic. We cannot wait to see this beast completely welded together – Stephan’s brand of sheer sculpting talent mashed up with his nerdy love of natural history is going to produce a glorious show. Stephan Webb’s “Evolutionary End Game” opens at Stranger Factory on April 5th. An opening reception will be held on April 5th from 6-9pm, and Stephan will be present.